Note: All theses/dissertations must be submitted electronically.If you plan to graduate during SPRING 2019, please adhere to the following deadlines: If you have applied for Spring Semester graduation and find you will not be able to meet one of these deadlines, you must notify the Graduate School prior to the deadline, or your file may be placed on inactive status. 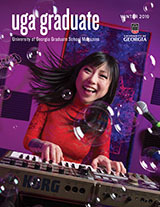 Write the Graduate School, 210 S. Jackson St., Athens, GA 30602 or email: gradinfo@uga.edu. Graduate students must register for a minimum of 3 hours in at least two semesters per academic year (Fall, Spring, Summer), including the 3 hours of graduate credit that is required for registration during the semester in which degree requirements are completed.To review the Graduate Enrollment policy, please click here. Final date for graduate students to submit an Application for graduation for May 2019. Final date for submitting program of study forms to the Graduate School for graduation in May 2019. An approved Advisory Committee form for Master of Arts, Master of Science, and all doctoral Candidates must be on file by this date. Final date for submitting applications for admission to candidacy to the Graduate School for doctoral candidates who plan to graduate in May 2019. If you were not admitted to candidacy prior to October 1, 2018 you must register for 10 hours Spring 2019. Final date for submitting requests for transfer of credit, with accompanying transcripts, to the Graduate School for students graduating in May 2018. Final date for submitting one complete copy of a thesis or dissertation for a format check for May 2019 graduation. Final date for the receipt of the following by the Graduate School: Final Defense Approval Form & ETD Submission Approval Form (all doctoral, MS, MA, MHP, MLA) and final corrected ETD for Spring 2019 graduation. Graduation. Diplomas will be mailed approximately six to eight weeks after graduation. Address changes, if necessary, should be made with the Office of the Registrar to ensure receipt of diplomas. Date the Graduate School will accept theses/dissertations for format checks for future graduations. Note: All theses/dissertations must be submitted electronically.If you plan to graduate during SUMMER 2019, please adhere to the following deadlines:If you have applied for Summer Semester graduation and find you will not be able to meet one of these deadlines, you must notify the Graduate School prior to the deadline, or your file may be placed on inactive status. Write the Graduate School, 210 S. Jackson St., Athens, GA 30602 or email: gradinfo@uga.edu. Graduate students must register for a minimum of 3 hours in at least two semesters per academic year (Fall, Spring, Summer), including the 3 hours of graduate credit that is required for registration during the semester in which degree requirements are completed. To review the Graduate Enrollment policy, please click here. Final date to apply for degree/certificate for August 2019 graduation. Final date for submitting program of study forms to the Graduate School for graduation in August 2019. An approved Advisory Committee form for Master of Arts, Master of Science, and all doctoral Candidates must be on file by this date. Final date for submitting applications for admission to candidacy to the Graduate School for doctoral candidates who plan to graduate in August 2018. If you were not admitted to candidacy prior to January 25, 2019, you must register for 10 hours Summer 2018. Final date for doctoral students to submit information for Fall 2019 Commencement program. Final date for submitting requests for transfer of credit, with accompanying transcripts, to the Graduate School for students graduating in August 2019. Final date for submitting one complete copy of a thesis or dissertation for a format check for August 2019 graduation. Final date for the receipt of the following by the Graduate School: Final Defense Approval Form (all doctoral, MS, MA, MHP, MLA) and corrected copy of thesis/dissertation for August 2019 graduation. Date of degree conferral. Diplomas will be mailed approximately six to eight weeks after graduation. Address changes, if necessary, should be made with the Office of the Registrar to ensure receipt of diplomas. Students completing degree requirements during Summer 2019 will have the option to participate in Fall 2018 commencement ceremony. Note: All theses/dissertations must be submitted electronically.If you plan to graduate during FALL 2018, please adhere to the following deadlines:If you have applied for Fall Semester graduation and find you will not be able to meet one of these deadlines, you must notify the Graduate School prior to the deadline, or your file may be placed on inactive status. Write the Graduate School, 210 S. Jackson St., Athens, GA 30602 or email: gradinfo@uga.edu. Final date for graduate students to submit an Application for Graduation for December 2019 Graduation. Final date for submitting program of study forms to the Graduate School for graduation in December 2019. An Advisory Committee form for Master of Arts, Master of Science, and all doctoral Candidates must be on file by this date. Final date for submitting applications for admission to candidacy to the Graduate School for doctoral candidates who plan to graduate in December 2019. If you were not admitted to candidacy prior to June 21, 2019, you must register for 10 hours Fall 2019. Final date for submitting requests for transfer of credit, with accompanying transcripts, to the Graduate School for students graduating in December 2019. Final date for doctoral students to submit information for Commencement program for December 2019 graduation. Final date for submitting one complete copy of a thesis or dissertation for a format check for December 2019 graduation. Final date for the receipt of the following by the Graduate School: Final Defense Approval Form (all doctoral, MS, MA, MHP, MLA) and corrected copy of thesis/dissertation for December 2019 graduation (http://t.uga.edu/22H). Final date for completing all requirements except submission of theses/dissertations (see earlier deadlines). The Graduate School must receive notification concerning removal of incompletes, final examinations, etc., for December 2019 graduation (This does not include grades for courses in which students are currently enrolled).